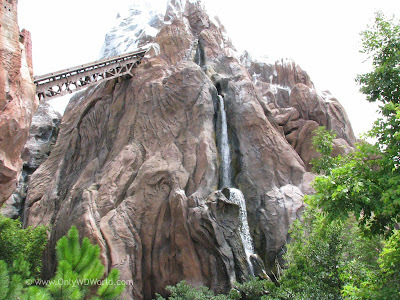 One of the tallest mountains in Florida can be found in Disney's Animal Kingdom Theme Park at the Walt Disney World Resort. At 199.5 ft tall Expedition Everest: Legend Of The Forbidden Mountain is a foreboding sight. It is also home to one of the best combinations of storytelling and thrill ride that you will find at Disney World or any other place. All Disney World attractions start with the storytelling. 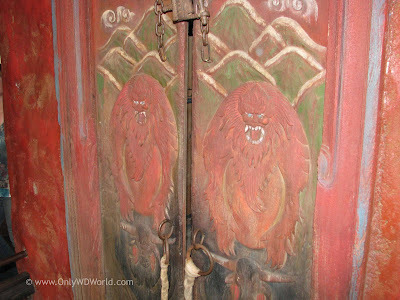 For Expedition Everest the Disney Imagineers turned to the legendary creature called the Yeti for inspiration. 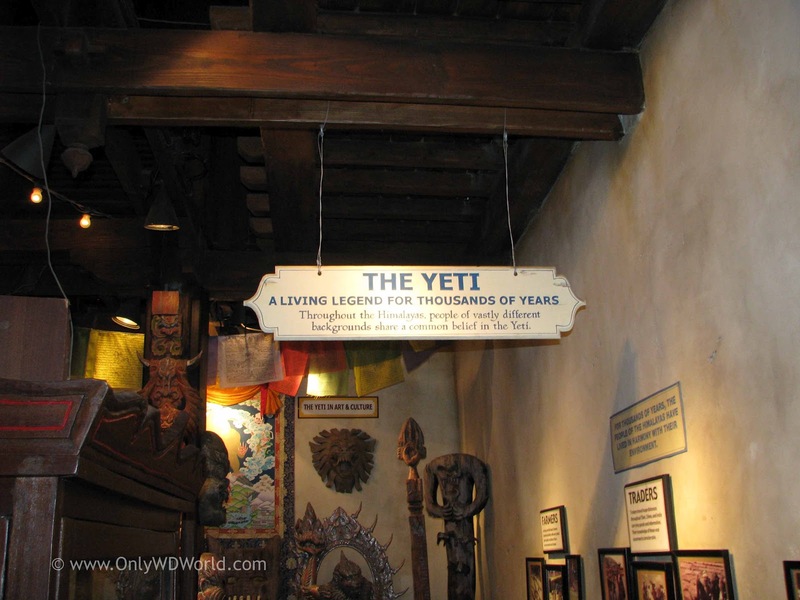 They travelled to Nepal and parts of Asia to collect stories and artifacts of the Yeti to use to create their own story that brings this legend to life. 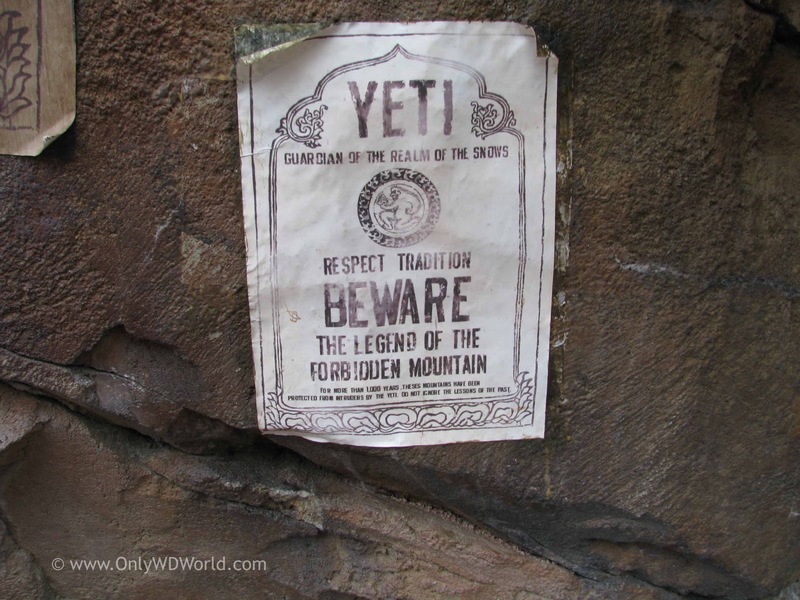 Instead of just creating a roller coaster, Disney has created a story immersing the guests in a journey into the realm of the Yeti and let's them deal with the consequences of crossing his path. 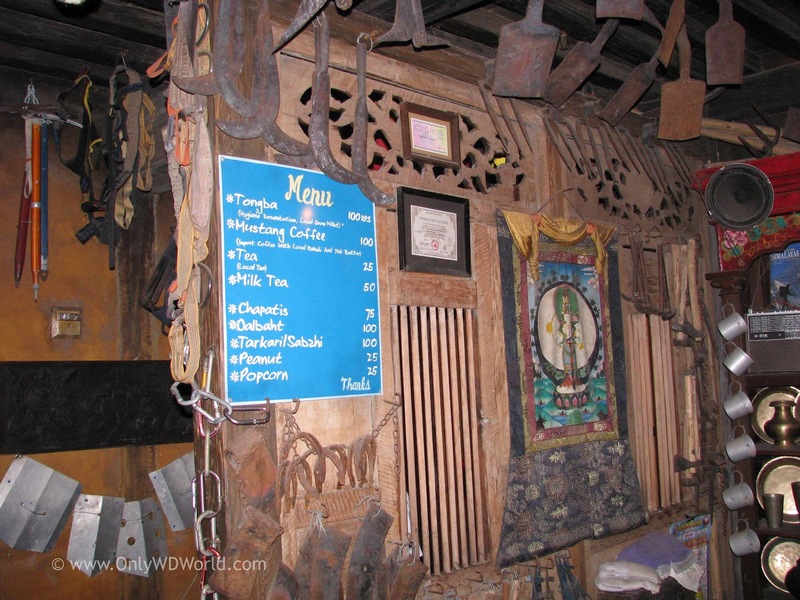 The base camp town that you encounter is called Serka Zong. Here you will find shops, expedition outfitters, shrines to the Yeti, a Yeti Museum, the rail station for the Anandapur Rail Services. 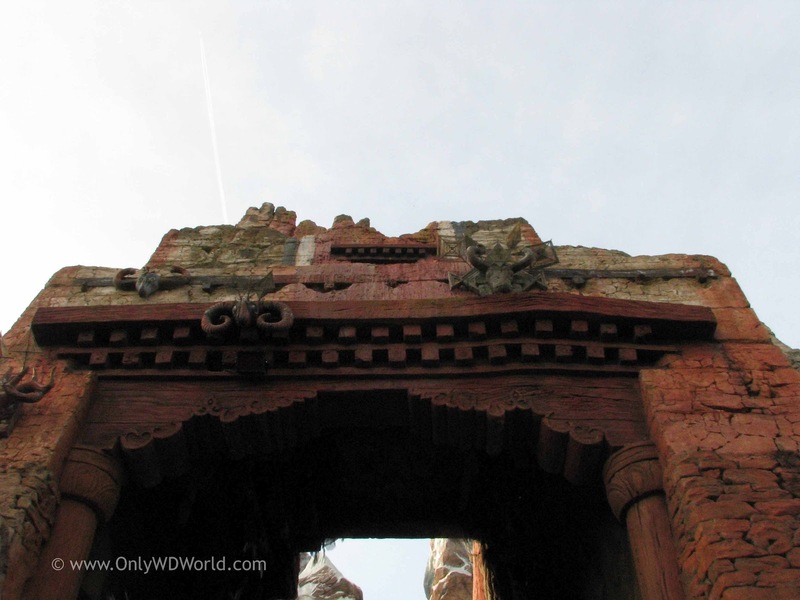 As you weave your way through the town, you will have the opportunity to see a wealth of detail. If you are able to move slowly take advantage of the extra time and look all around you to take it all in. As you enter the buildings you encounter the offices of Himalayan Escapes, the touring outfit who puts together the Everest Expeditions. 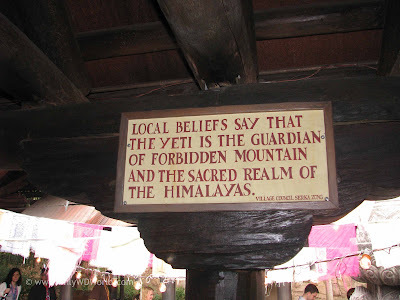 You are reminded throughout that the locals believe that the Yeti is to be respected and is considered to be the guardian of Forbidden Mountain. 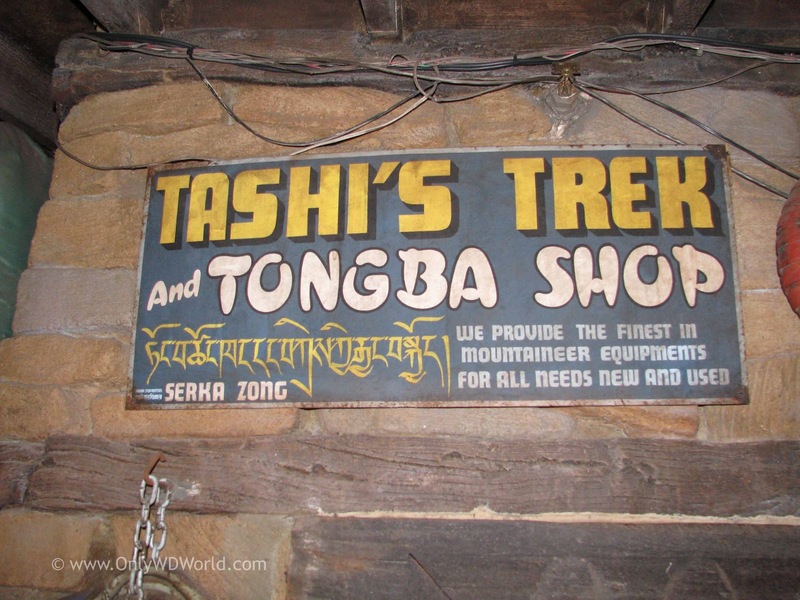 The above sign is posted by the Village Council of Serka Zong. 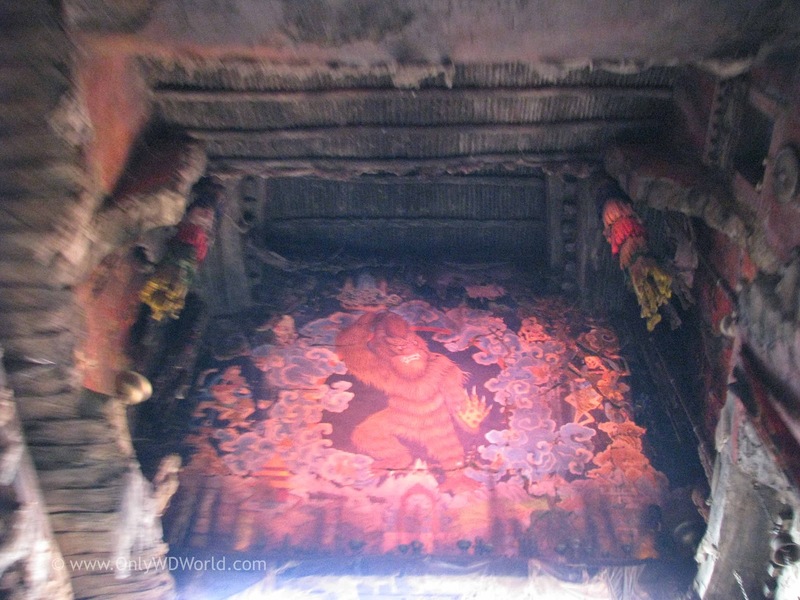 As you make your way through Serka Zong you will see Yeti shrines and Yeti based artwork. You can stock up on trekking gear at Tashi's Trek and Tongba Shop here in Serka Zong. 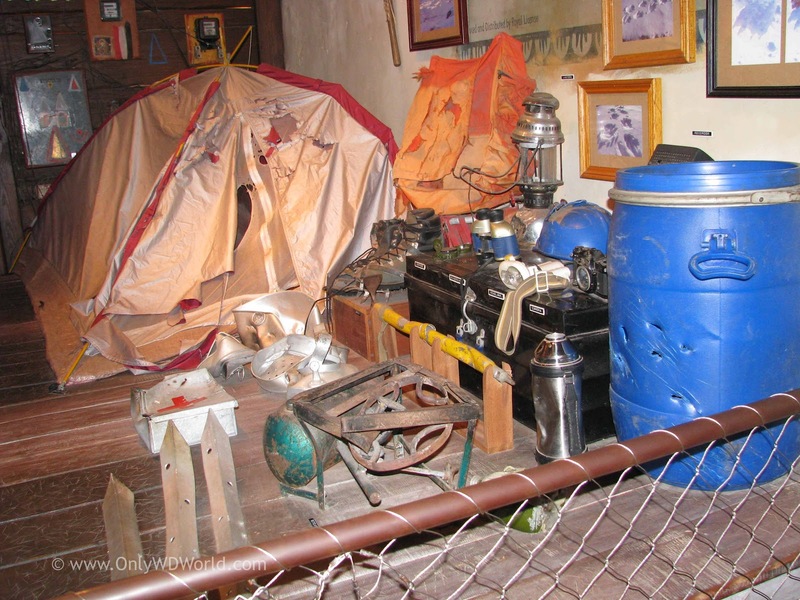 They provide the finest in mountaineering equipments for all needs both new and used. 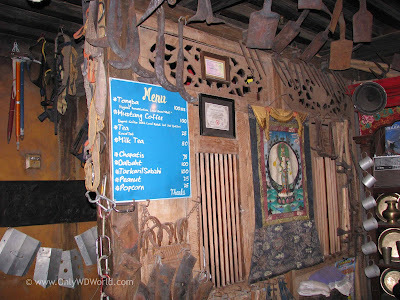 There is even a snack bar that offers Tea and Coffee in the shop. 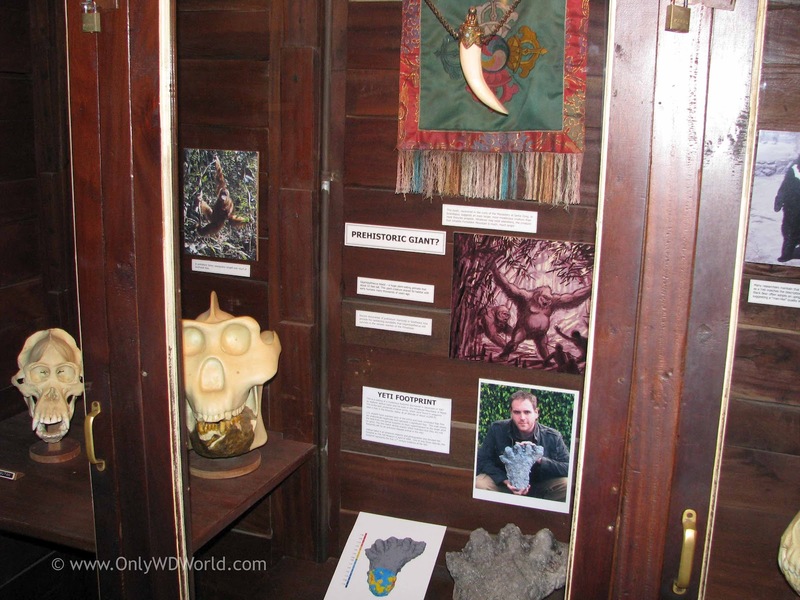 Within the Yeti Museum you can learn about the Yeti. 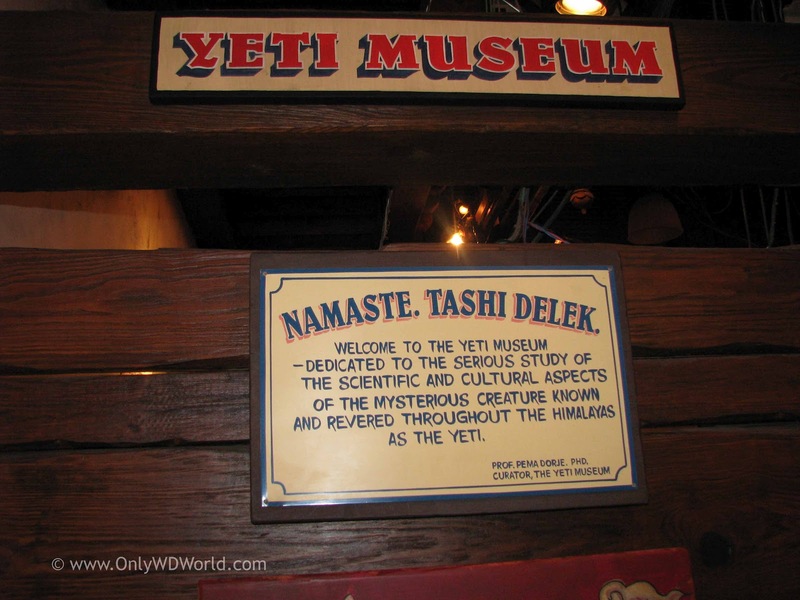 This museum is "dedicated to the serious study of the scientific and cultural aspects of the mysterious creature known and revered throughout the Himalayas as the Yeti." 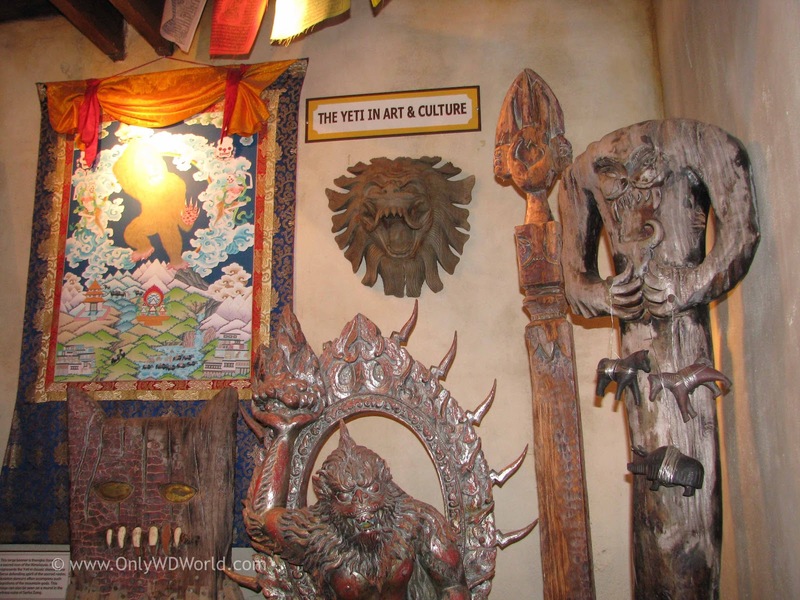 The museum shows artifacts detailing the communities rich history involving the legend of the Yeti. 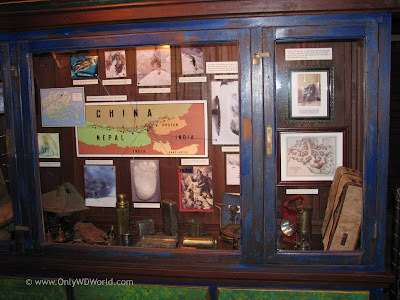 On display you will find many examples of Yeti artwork. 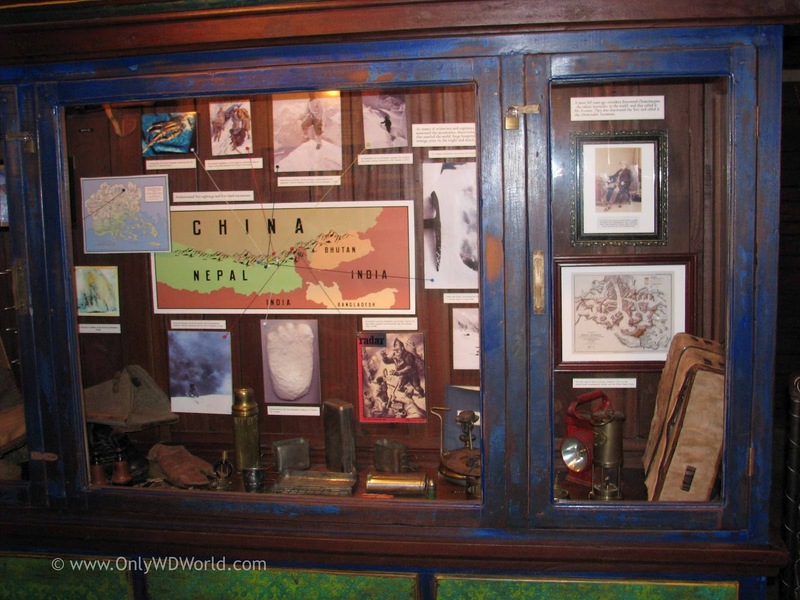 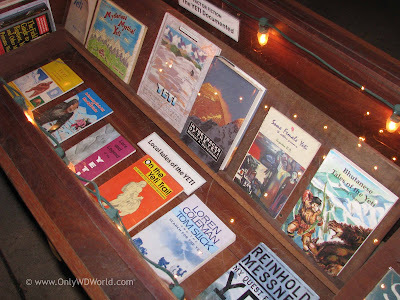 You will also discover maps detailing the areas where the Yeti has been spotted and numerous examples of books on the topic of the Yeti. There is also artifacts from a campsite that was discovered, but the campers who occupied it were never seen from again. Could they have been attacked by the Yeti? 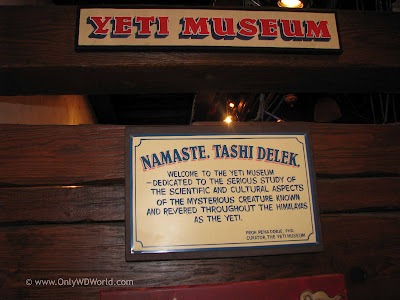 Lastly you will see anthropological evidence that the Yeti must really exist. Now it is time for to board the ride itself. Himalayan Escapes - Tours & Expeditions has booked you on an Anandapur Rail Services Train through the Forbidden Mountain to the base of Mount Everest. 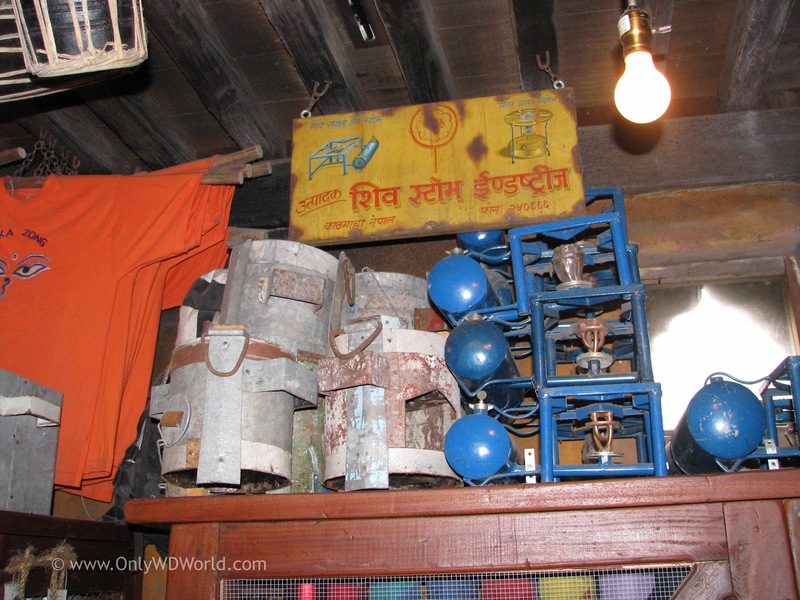 As the Disney Imagineers have told the story, this train will transport the trekkers through the Forbidden Mountain to the base of Mount Everest. 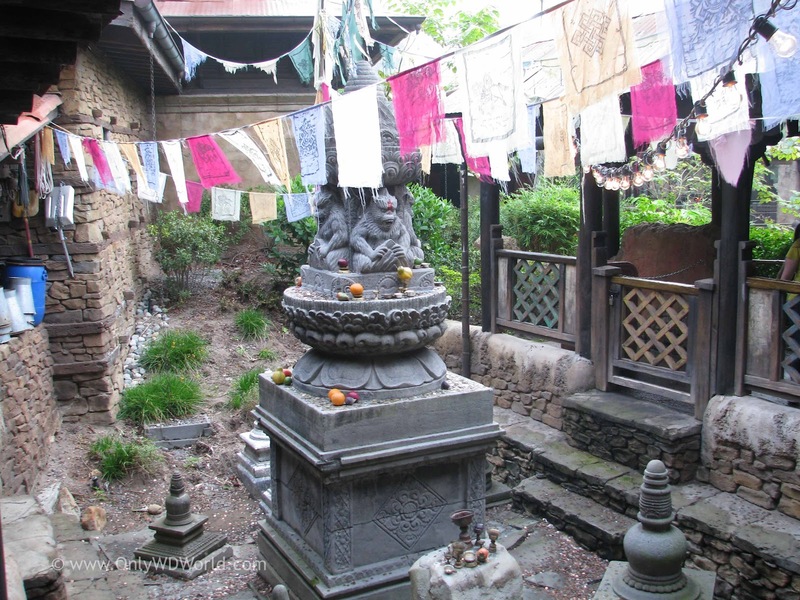 The locals have warned them about the dangers of passing through Forbidden Mountain but Himalayan Escapes has ignored the warnings. Passengers get to see some magnificent views as the train starts its ascent. The Yeti idols dart the landscape and let the passengers know they are entering Forbidden Mountain, which is the home of the Yeti. 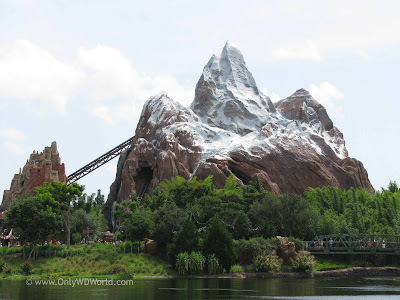 This is a great glimpse of the mountain that the train will soon be climbing. 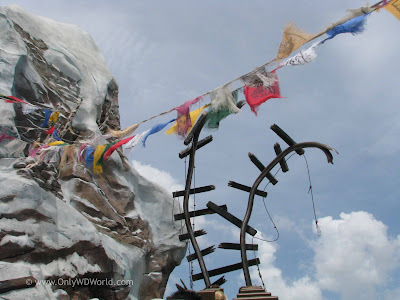 The train passes through the this large Yeti shrine. 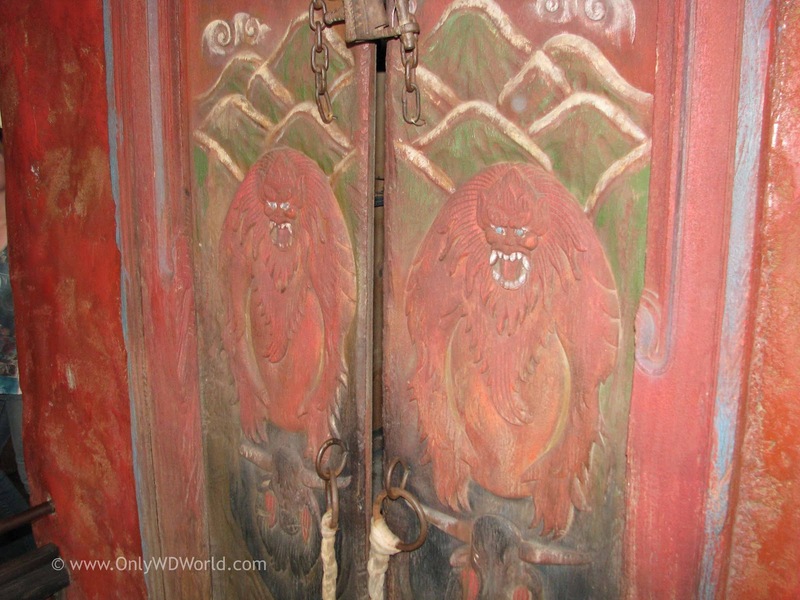 Don't close your eyes or you will miss the incredible details inside the shrine. 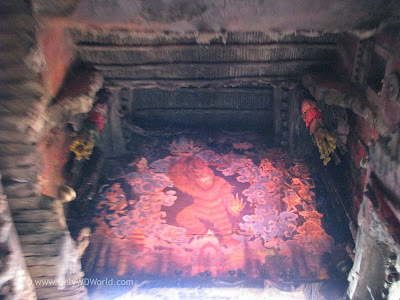 The artwork is spectacular. 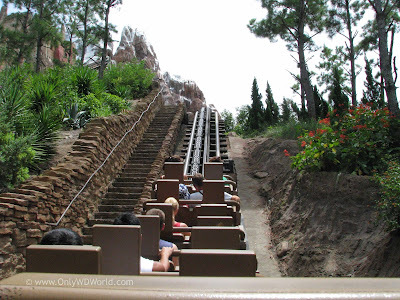 The first real thrill of the ride is the unexpected scene as you round the corner at the top of the mountain. 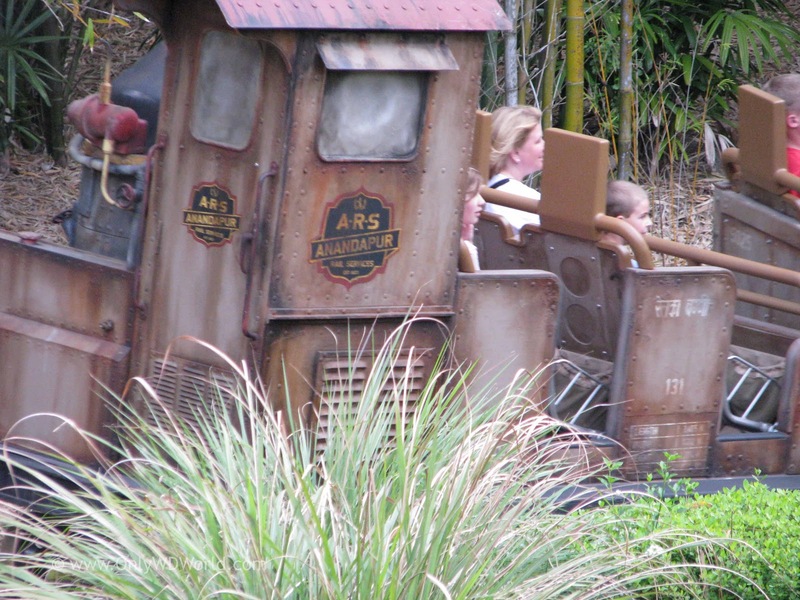 The track has been destroyed and you cannot go forward any more. 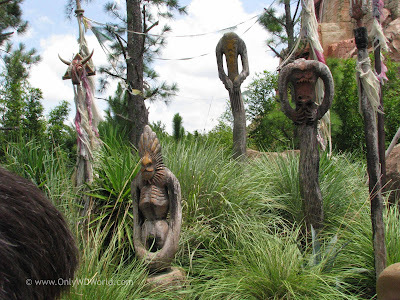 This is quite an unsettling feeling the first time that you experience this ride. 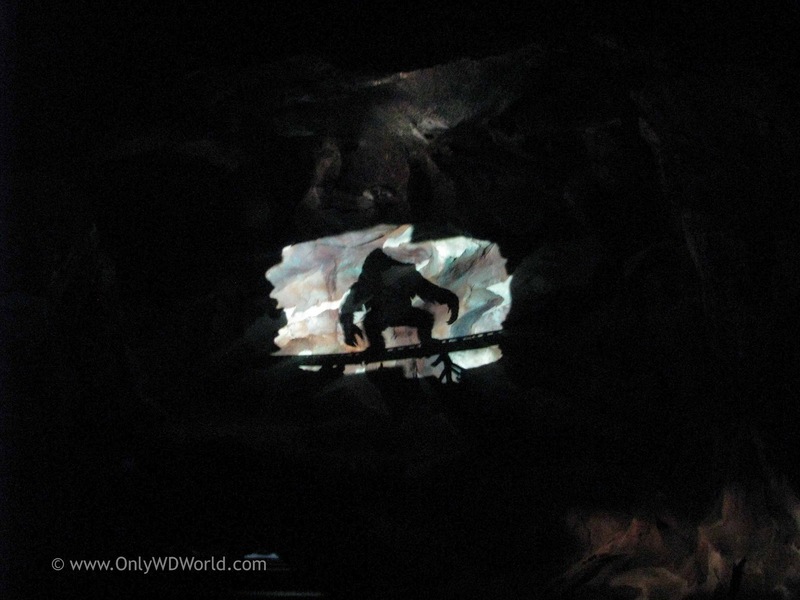 The train starts racing backwards through the inside of the mountain. 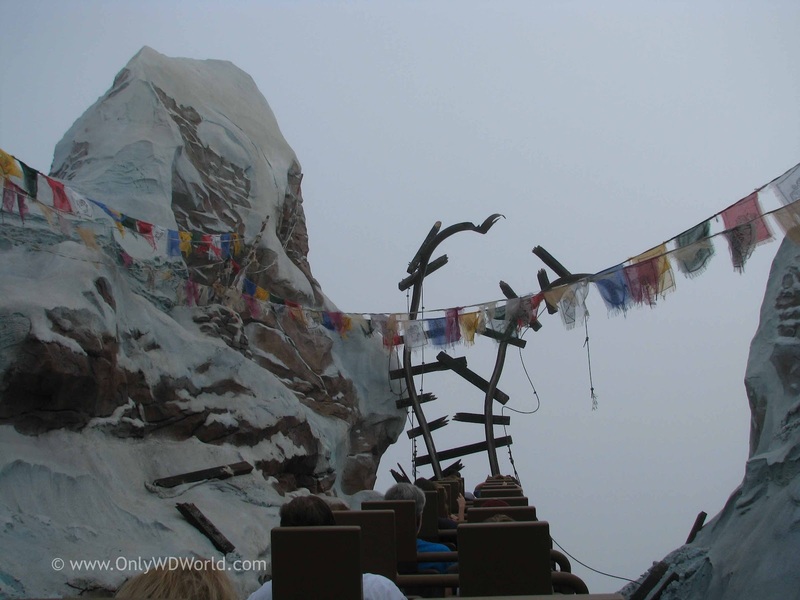 When you come to a stop you see the sight shown in the above picture where you see the shadow of the Yeti ripping apart the track. 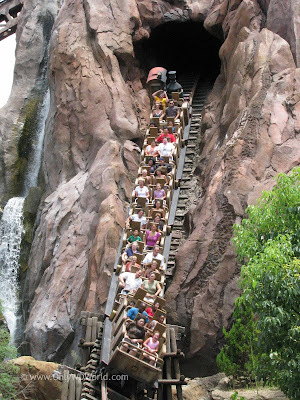 Then you start racing forward inside the mountain again. For the big drop you race outside into the open for a brief moment. 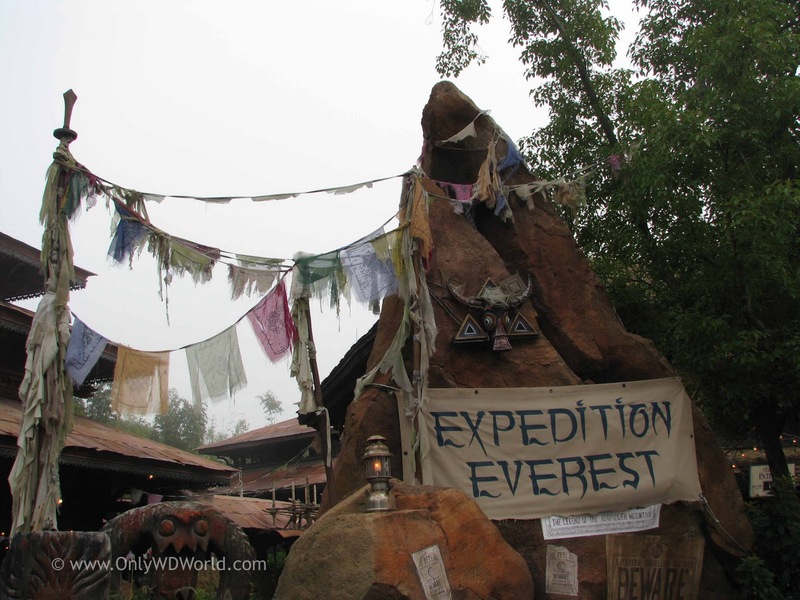 Then you will soon re-enter the mountain. Shortly you will encounter the Yeti himself, although the current audio-animatronic Yeti is only a pale rendition of the original version. Structural stresses over time have led the Imagineers to keep the Yeti stationary instead of having the movement that was part of the original attraction. 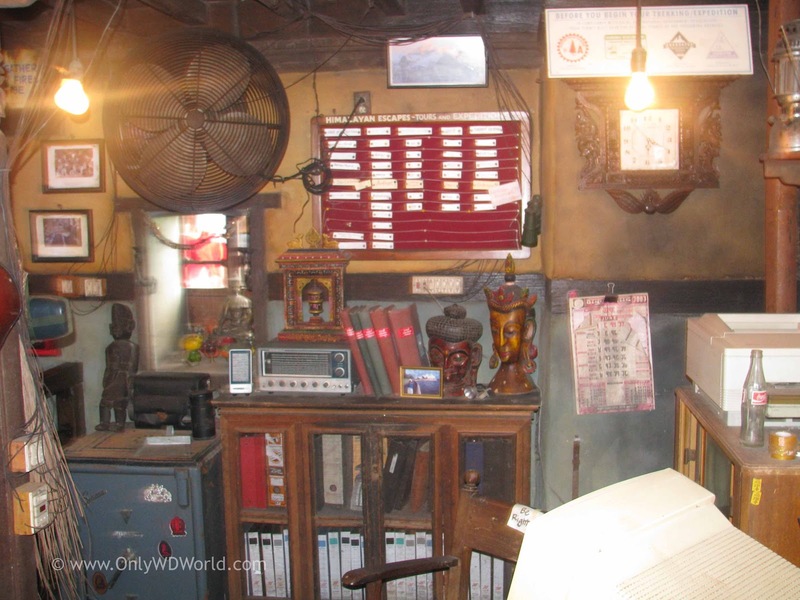 It is still impressive, but not near as good as it used to be. 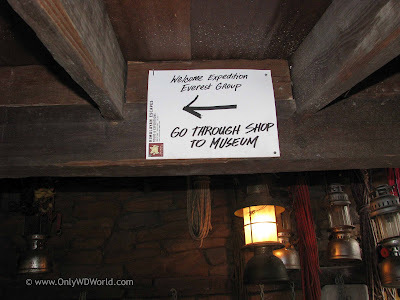 The Expedition Everest attraction is certainly one of the best that Disney World has to offer. 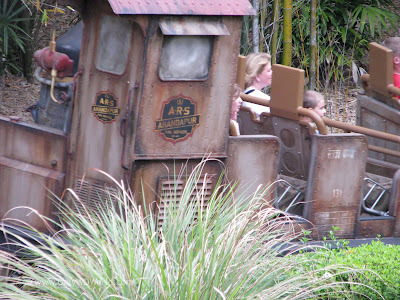 Although the ride in itself would be thrilling, the story that they have wrapped around it, make it a truly memorable experience that you want to visit again and again. 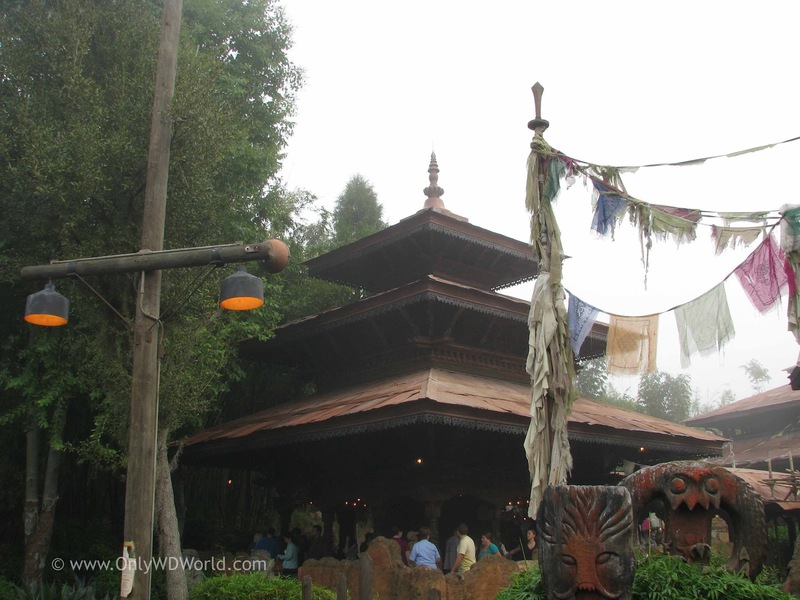 0 comments to "Disney World Rides: Expedition Everest Takes Roller Coaster Storytelling To New Heights"